New Horizons finished its testing at the Johns Hopkins Applied Physics Laboratory (APL) last month. On June 13, the New Horizons spacecraft left its birthplace, APL, for space-environment testing at NASA's Goddard Space Flight Center. New Horizons has already completed several tests in its first few weeks at Goddard. These include acoustic testing that simulates the noise of launch and shock testing that simulates other aspects of launch day. The spacecraft has also undergone its initial spin balance for flight. As I write this column, another multi-day mission simulation is taking place, and preparations are being made for the thermal-vacuum testing that will begin just after July 4 and probably last into early September. An artist's conception (above) and an early Hubble Space Telescope image. This PI's Perspective column is for July 2005, a particularly interesting month for the project in terms of anniversaries. The week of July 11 marks the T-minus 6-month point from our launch window opening. The week of July 11 is also 10 years to the week from our hoped-for July 2015 encounter with Pluto-Charon. July is also the month in which Pluto's satellite, Charon, was discovered, back in 1978. It's an interesting and little known fact that Charon was discovered entirely by accident, thanks to some sharp thinking by U.S. 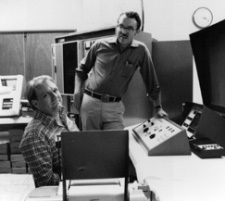 Naval Observatory astronomers James (Jim) Christy and his late colleague, Robert (Bob) Harrington. At the time, Jim Christy was involved in a routine assignment to improve the accuracy of knowledge about Pluto's orbit. In late June 1978, Christy was analyzing the astronomical images that made up his dataset when noticed a bump, with about 1/4th the brightness of Pluto and about 1/4000th of a degree to the side of Pluto in most of the images. Jim Christy didn't know it at the time, but the bump had been noticed by other astronomers as far back as 1965, who thought it was due to either photographic defects or atmospheric blurring, as the twinkling of stars sometimes causes. But Jim noticed that in the images he was analyzing, all the stars were round—only Pluto had an elongation (or bump) on its side! And when he checked other Pluto images made in 1978 and earlier, at Bob Harrington's suggestion, Christy found the bump was cyclically moving back and forth around Pluto every 6.387 days—the same period as which Pluto rotates! Since the bump was too high to be a mountain (about 20,000 kilometers over Pluto, he estimated), Christy and Harrington concluded that their bump had to be a large satellite. The announcement of their find was made on July 7, 1978. Within a few weeks, the object was named Charon after Pluto's companion Kharon in mythology (but most Americans pronounce the name as "Sharon," in honor of Christy's wish that the name also honor his wife, Charlene). From Charon's orbit and Kepler's third law, it was immediately possible for Christy and Harrington to determine a fairly accurate mass for the Pluto-Charon pair—something that had never before been possible. Later, once Pluto's size was determined by independent techniques, Newton's Third Law was use to yield an average density for the Pluto-Charon pair of very close to 2 grams per cubic centimeter. This in turn indicated that the pair had to be mostly made not of ice—as had long been thought—but instead primarily of rock, with a dose of water ice and other minority-share constituents that made up only about a third of the pair's mass. 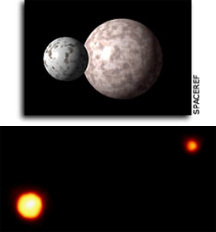 Like the discovery of Pluto in 1930, which we now know presaged the discovery of the Kuiper Belt in 1992, we now also know that the discovery of Charon in 1978 presaged the discovery of binary Kuiper Belt Objects that occurred in 2001. (About 15% of Kuiper Belt objects appear to have satellites.) What a wonderful historical symmetry! Jim Christy (left) and Bob Harrington,1978.